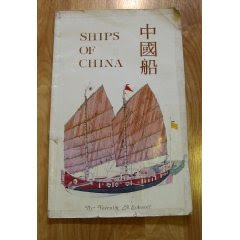 Ships of China is a wonderful picture book, illustrated by the author, Valentin A. Sokoloff. Measuring 10"x16", the self-published book has only 54 pages, but each contains a lovely watercolor painting of a Chinese boat type, accompanied by a paragraph or two of nicely hand-lettered text. Published in 1982, the book is out of print and probably very difficult to come by. River Police Boats called "Fast Crabs" were recognizable by white & blue sails. It is recorded that 161 police boats were operating on the Yangtze river. They were up to 40 feet in length, carried up to 10 oars, several quanting poles & a crew of 46. The galley was located in the hold just ahead of the mast & the crew slept aft the mast. The boats as shown above disappeared after 1911. The duties of the police boats included recording of boat movements & enforcing payment of taxes & for this purpose they were located one above & one below custom stations. They also cooperated with life boats...(which I'll endeavor to include in my next post). It may be difficult to see in the top image (click the picture to pull up a larger image), but there's a gun mounting in the bows. This was probably a very imposing deterrant to smugglers and other customs-evaders. A crew of 46 on a 40-foot boat is, well, crowded. If the gun didn't do it, there was clearly no shortage of force for a boarding party. Since the crew slept aft of the mast, the officers must have occupied the comparatively spacious deckhouse. Posh! Note the rudder -- much like an American sharpy's rudder -- designed for shallow-draft work. The boat appears to be flat-bottomed, too. I would be delighted to be contacted by the author to express thanks and acknowledge permission for reproducing this material (or, indeed, to remove this post if the author so requests). If the map appears blank, click it and it'll appear. Then click the various flags on the map for details and photos of the boat types indigenous to the area. 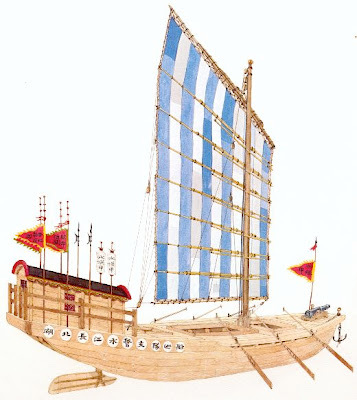 By the way, a chine log is a longitudinal timber on flat- and v-bottom boats, located at the intersection of the boat's sides and bottom, generally on the inside of the hull (although it's not unheard of to place it on the outside). Chine bLog is a clever pun.